When you hear news about cities that are making the most of the solar boom, it’s only natural to think that the leading solar cities are all in really sunny locations, which is true for the most part, but the latest rankings of America’s top solar cities has a few surprises in store. According to the latest report from Environment America, solar is expanding rapidly in the US, with a cumulative total of about 20,500 MW of solar electric installations online, which has the capacity to power about four million average homes with clean renewable energy. The new report, Shining Cities: Harnessing the Benefits of Solar Energy in America, covers 65 US cities that are leading the way in solar, with a combined 1.3 GW of capacity. To put that figure into perspective, that’s more solar PV capacity than was installed in the nation in 2009, so we’re starting to make some serious solar progress. There are two basic methods of ranking these solar cities, either by total installed solar capacity (which simply means the more solar PV, the higher the ranking), or by solar PV per capita. For the total installed solar capacity, the top three solar cities are somewhat obvious, with Los Angeles (170 MW), San Diego (149 MW), and Phoenix (115 MW) leading the way, and San Jose (105 MW) and Honolulu (96 MW) taking spots five and six. But right in amongst those solar cities is a decidedly non-stereotypical solar hotspot, yet Indianapolis, Indiana, with its 107 MW of installed solar PV, takes fourth place for total installed solar capacity. 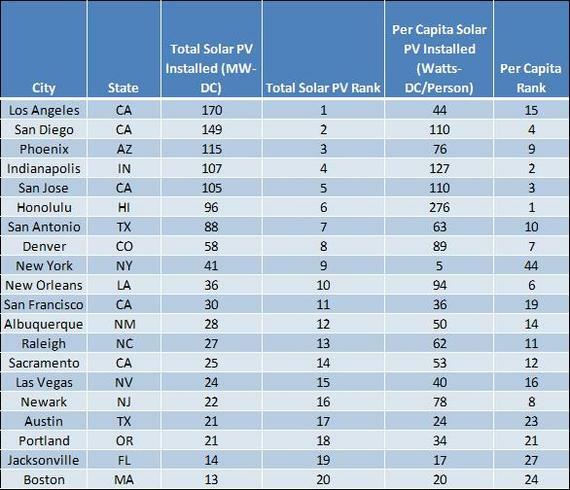 When these figures are sorted on a per capita basis, which is a more revealing method of calculating the top solar cities, yet another surprising fact arises. 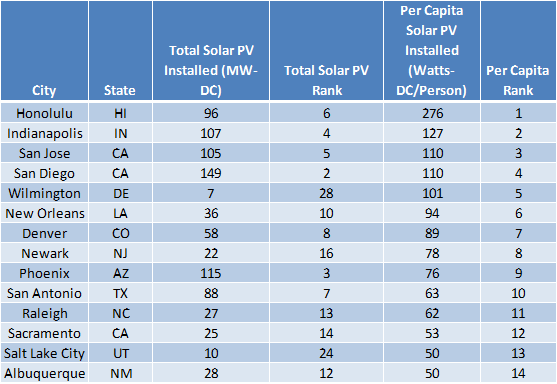 At the top of the list is Honolulu, a clear leader with its 96 MW, but the number two solar city in the US, when ranked by the amount of solar PV installed per person (Watts DC per person), is Indianapolis yet again. Los Angeles, with its sunny climate and 3.8 million people, is a natural choice for solar, but it didn’t even make the top 20 Solar Stars list, and yet Indianapolis, with its midwestern weather patterns and just 850,000 people, is right at the top of the list, ranking higher than San Jose, San Diego, and Phoenix. It just goes to show that cities that want to shift to more renewable energy certainly can, even in areas not commonly considered to be solar leaders. You can grab a copy of the free Shining Cities report (PDF) at Environment America. Find out how your rooftop can produce clean renewable solar power today!